At the OOP 2012 conference I attended a session „Story Points considered harmful“ by Vasco Duarte and Joseph Pelrine. 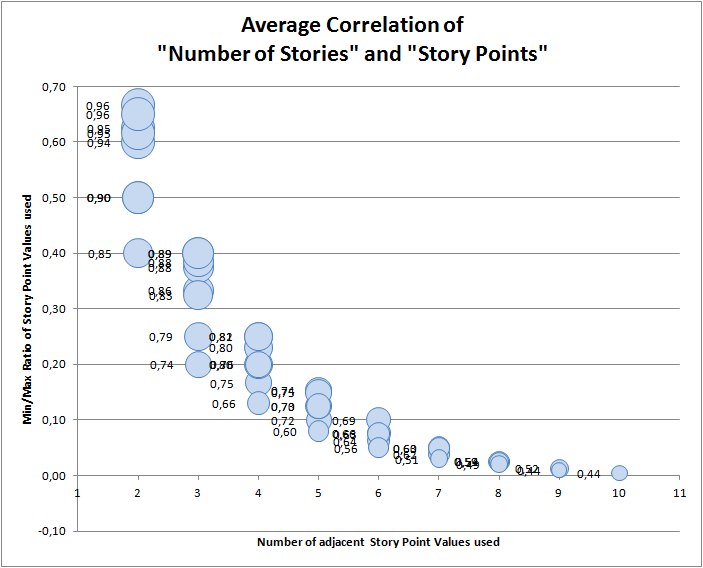 The main hypothesis of them was that the sum of story points correlate highly with the number of stories so that it should be more than enough to work with the number of stories only and dismiss the use of story points completely. I did some spreadsheet experiments with a huge number of possible story point sets. The spreadsheet created these sets for any possible combination of adjacent story points out of the base set „0.5 1 2 3 5 8 13 20 40 100“. Take a look at the following chart. The size of the bubbles is the average correlation of „Number of Stories“ and „Sum of Story Points (Velocity)“ for 100 sprints full of randomly distributed story points. There are 45 distinct combinations, i.e. the calculated values are based on 4,500 simulated sprints. Do not use story points for release planning. Use other size and epic indicators like e.g. t-shirt sizes for release planning. Reason: a release backlog contains both small and epic items which leads to wide spread story point values. As soon as you work with real numbers people tend to sum them up and do all kinds of arithmetics with them. Unfortunately you can’t predict that a 40 point item really takes 20 times the effort of a 2 point item. This is an useless traditional approach leading to false security of project planning. Change your mind set and accept the empirical process control of agile planning and estimation methods. What is your opinion and experience working with story points? I’m looking forward to getting your feedback.